Adults and pediatric patients age 12 years and older: two tablets (each containing lumacaftor 200 mg/ivacaftor 125 mg) taken orally every 12 hours with fat-containing food. Examples of appropriate fat-containing foods include eggs, avocados, nuts, butter, peanut butter, cheese pizza, whole-milk dairy products (such as whole milk, cheese, and yogurt), etc. If a patient misses a dose and remembers the missed dose within 6 hours, the patient should take the dose with fat-containing food. If more than 6 hours elapsed after the usual dosing time, the patient should skip that dose and resume the normal schedule for the following dose. A double dose should not be taken to make up for the forgotten dose [see Clinical Pharmacology (12.3) and Patient Counseling Information (17)]. No dose adjustment is necessary for patients with mild hepatic impairment (Child-Pugh Class A). 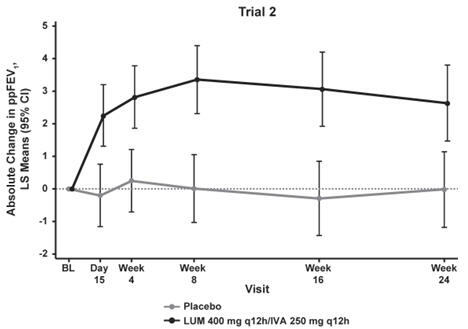 A dose reduction to 2 tablets in the morning and 1 tablet in the evening (lumacaftor 600 mg/ivacaftor 375 mg total daily dose) is recommended for patients with moderate hepatic impairment (Child-Pugh Class B). Studies have not been conducted in patients with severe hepatic impairment (Child-Pugh Class C), but exposure is expected to be higher than in patients with moderate hepatic impairment. Therefore, use with caution at a maximum dose of 1 tablet in the morning and 1 tablet in the evening (lumacaftor 400 mg/ivacaftor 250 mg total daily dose), or less, in patients with severe hepatic impairment after weighing the risks and benefits of treatment [see Use in Specific Populations (8.6), Clinical Pharmacology (12.3), and Patient Counseling Information (17)]. No dose adjustment is necessary when CYP3A inhibitors are initiated in patients already taking ORKAMBI. However, when initiating ORKAMBI in patients currently taking strong CYP3A inhibitors (e.g., itraconazole), reduce ORKAMBI dose to 1 tablet daily (lumacaftor 200 mg/ivacaftor 125 mg total daily dose) for the first week of treatment. Following this period, continue with the recommended daily dose. If ORKAMBI is interrupted for more than 1 week and then re-initiated while taking strong CYP3A inhibitors, patients should reduce ORKAMBI dose to 1 tablet daily for the first week of treatment re-initiation. Following this period, continue with the recommended daily dose. The recommended dose of INCIVEK tablets is 1125 mg (three 375-mg tablets) taken orally twice daily (10-14 hours apart) with food (not low fat) [see Clinical Pharmacology (12.3)]. For specific dosage instructions for peginterferon alfa and ribavirin, refer to their respective prescribing information. The recommended duration of treatment with INCIVEK is 12 weeks in combination with peginterferon alfa and ribavirin. HCV RNA levels should be monitored at weeks 4 and 12 to determine combination treatment duration and assess for treatment futility (Tables 1 and 2). For the purpose of assessing response-guided therapy eligibility at weeks 4 and 12 (see Table 1), an "undetectable" HCV RNA (Target Not Detected) result is required; a confirmed "detectable but below limit of quantification" HCV RNA result should not be considered equivalent to an "undetectable" HCV RNA (Target Not Detected) result [see Laboratory Tests (5.5)]. Treatment-naïve patients with cirrhosis who have undetectable HCV RNA (Target Not Detected) at weeks 4 and 12 of INCIVEK combination treatment may benefit from an additional 36 weeks of peginterferon alfa and ribavirin (48 weeks total) [see Clinical Studies (14.2)]. To prevent treatment failure, the dose of INCIVEK must not be reduced or interrupted. Refer to the respective prescribing information for dose modification of peginterferon alfa and ribavirin [see Warnings and Precautions (5.6)]. Patients with inadequate viral response are unlikely to achieve SVR, and may develop treatment-emergent resistance substitutions [see Microbiology (12.4)]. Discontinuation of therapy is recommended in all patients with (1) HCV RNA levels of greater than 1000 IU/mL at Treatment Week 4 or 12; or (2) confirmed detectable HCV RNA levels at Treatment Week 24 (see Table 2). If peginterferon alfa or ribavirin is discontinued for any reason, INCIVEK must also be discontinued. KALYDECO should be taken with fat-containing food. Examples include eggs, butter, peanut butter, cheese pizza, whole-milk dairy products (such as whole milk, cheese, and yogurt), etc. 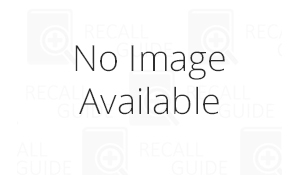 [see Clinical Pharmacology (12.3) and Patient Counseling Information (17)]. The recommended dose of KALYDECO for both adults and pediatric patients age 6 years and older is one 150 mg tablet taken orally every 12 hours (300 mg total daily dose) with fat-containing food [see Dosage and Administration (2.1)]. The recommended dose of KALYDECO (oral granules) for patients ages 2 to less than 6 years is weight-based according to Table 1. The entire contents of each packet of oral granules should be mixed with one teaspoon (5 mL) of age-appropriate soft food or liquid and completely consumed. Food or liquid should be at or below room temperature. Once mixed, the product has been shown to be stable for one hour, and therefore should be consumed during this period. Some examples of soft foods or liquids may include puréed fruits or vegetables, yogurt, applesauce, water, milk, or juice. Each dose should be administered just before or just after fat-containing food [see Dosage and Administration (2.1)]. A safe and efficacious dose of KALYDECO for pediatric patients less than 2 years of age has not been established. The use of KALYDECO (oral granules) in children under the age of 2 years is not recommended. The dose of KALYDECO should be reduced to one tablet or one packet of oral granules once daily for patients with moderate hepatic impairment (Child-Pugh Class B). 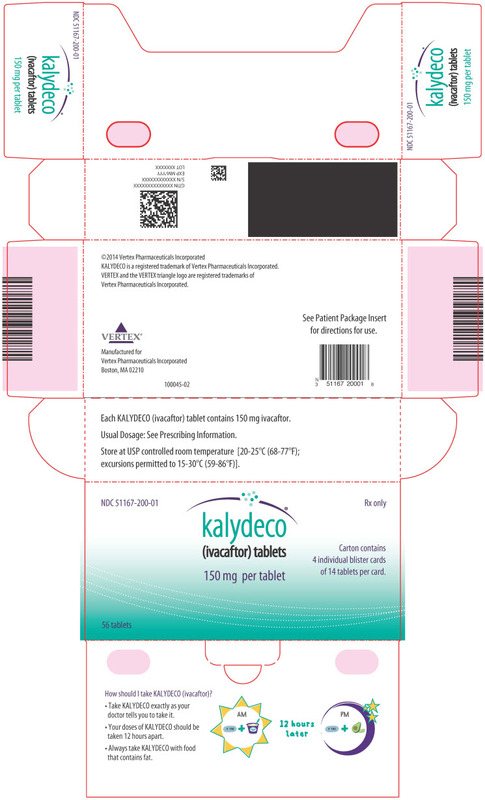 KALYDECO should be used with caution in patients with severe hepatic impairment (Child-Pugh Class C) at a dose of one tablet or one packet of oral granules once daily or less frequently [see Use in Specific Populations (8.6), Clinical Pharmacology (12.3), and Patient Counseling Information (17)]. When KALYDECO is being co-administered with strong CYP3A inhibitors (e.g., ketoconazole), the dose should be reduced to one tablet or one packet of oral granules twice a week. The dose of KALYDECO should be reduced to one tablet or one packet of granules once daily when co-administered with moderate CYP3A inhibitors (e.g., fluconazole). Food containing grapefruit or Seville oranges should be avoided [see Drug Interactions (7.1), Clinical Pharmacology (12.3), and Patient Counseling Information (17)].